Ira Skutch, a producer-director and a television historian, has died at the age of 88. Skutch worked as a stage manager on some of the earliest regularly scheduled shows on NBC, including the landmark variety series Hour Glass (1946-47), the first hour-long entertainment series produced for network television. Moving up the ladder, he became a director on Philco Television Playhouse (helming the live commercials, and a few of the full productions themselves) and a producer-director on such series as Disc Magic, which featured popular songs played "live." 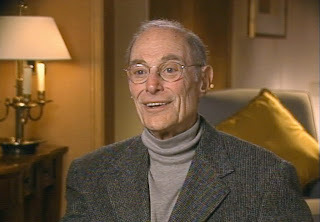 Ira Skutch is best known for his tenure at Mark Goodson-Bill Todman Productions, producing such series as Match Game. Skutch contributed to TV scholarship with The Days of Live and The Du Mont Television Network: What Happened? (co-written with Ted Bergmann) and worked with such directors as Delbert Mann on interview-style autobiographies. The Archive of American Television interviewed Ira Skutch on January 29, 2004 and the interview is currently available online. Ira Skutch was interviewed for nearly three hours in Los Angeles, CA. Skutch talked about his early years as a page and later manager of guided tours at NBC in the mid-1940s. He described in detail the layout of the NBC building, listing the various studios and the radio series that were produced in each, as well as which were modified to bring in television production. Skutch talked about his work as a stage manger on NBC’s earliest television series including NBC Television Theater, You Are an Artist, Face to Face, Kraft Television Theater, and the big budget variety series Hour Glass. Skutch discussed his work in technique and production as a director of “live” television commercials for television series as well as the 1952 political conventions. He chronicled his work as a director on such shows as Disc Magic (a 1946 precursor to music video), The Swift Home Service Club (one of network television first daytime series), and Philco TV Playhouse. Lastly Skutch talked in detail about his 26-year tenure as director, then producer at Mark Goodson-Bill Todman Productions, where he worked on such series as Beat the Clock, Play Your Hunch, and Match Game. The interview was conducted by Gary Rutkowski.